Three collisions on the M55 and M6 are causing delays for commuters this morning. The first collision happened shortly after 6.10am on the M55 Eastbound close to J1 (Preston, Garstang A6). Two collisions near J1 of the M55 in Preston happened with minutes of each other. The silver Toyota Yaris had been moved to the hard shoulder whilst police attended. The driver suffered a minor injury and has been arrested for alleged drug driving after a positive drugs swipe. Recovery are on the scene and the mangled vehicle has been seized. All lanes are clear and traffic is moving freely. A second collision involving four vehicles happened at around 7am on the M6 Southbound in Preston. The multi-vehicle collision happened on the M6 J32 (Blackpool, Preston (N), A6, M55) off slip road to the M55 J1 (Preston, Garstang A6). Debris from the crash had been scattered across the carriageway. 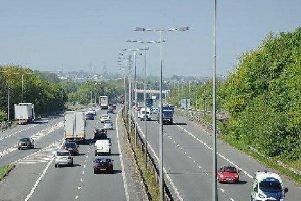 Police closed lane 1 (of 2) whilst emergency services attended the incident. Highways England said they expected the incident to be cleared between 8.15am and 8.30am. The lane closure will remain in place until the the vehicle has been recovered. Earlier this morning at around 6am, another crash forced police to introduce a rolling block on the M6 Northbound. The crash involved one vehicle and led to police enforcing a rolling block between J32 (Blackpool, Preston (N), A6, M55) and J33 (Lancaster South, A6). What is a rolling block? A rolling block is a form of traffic management where police slow down the traffic in all lanes in a controlled manner. The rolling block usually commences a few miles before the incident scene, so that emergency services have time to clear the incident without the need to stop all traffic. Police lead the traffic and keep queues slowly moving behind them. Once the incident is clear, traffic can be released back to speed.